Brie has fine-tuned her signature design technique of Foodscaping, a sustainable landscape practice that embraces beauty and bounty. Aiming to change the way landscapes are designed and managed, Brie encourages everyone to "think outside of the box." Learn how pairing edibles in a traditional ornamental landscape increases bio-diversity and adds purpose to everyday spaces. The best edible and ornamental plant combinations are featured to inspire attendees to create purposeful landscapes that engage people of all ages! Easy strategies are explained, including how to plant a bed edge to deter moles and voles. This is a fast paced, informative presentation that leaves attendees inspired and ready to foodscape! Mammal browse is one of the biggest challenges that gardeners face. From the best repellents to using plants to deter problem animals, Brie will explain her approach to dealing with unwanted wildlife in a suburban neighborhood. Accessible strategies are explained, including how to plant a bed edge to deter moles and voles and design approaches to deter deer, rabbits and groundhogs. Foodscaping is all about making the most of the square footage that is available. Discover strategies to cultivate a smaller footprint while still growing the flowers and food you love. Brie shares insights on how to design and manage a downsized garden. Learn about growing in containers and with new technologies, including patio friendly Aeroponic systems and Live Screens. Accessible strategies are explained, including how to plant bed edges to deter browsing mammals. From having a party ready patio to a bountiful property border Brie will share expert growing tips for a successful harvest. Grow like never before by utilizing the newest advancements in hydroponic technology. Brie explains the ins and outs of growing in water systems including Aeroponic towers, Aquaponic tanks and Hydroponic buckets. The term Hydroponic comes from Latin word meaning “working water” and this method of growing will increase yields and reduce your overall maintenance regiment. Learn how to integrate these systems into your landscape, patio and front porch. Discover everything you need to know to be a cutting edge grower no matter how much space or experience you have! Foodscape design requires a well balanced mix of flowering and edibles plants. Learn how to integrate perennials with your favorite vegetables to increase beauty and pollinator activity by pairing their cultural needs. Brie shares management strategies to make your edible perennial border low maintenance, full of life and bountiful with harvests. The most important thing we can do as stewards of the earth is teach the next generation to value the resources of the natural world. Brie has taken the foodscape platform into schools across the US, working with administrators, teachers, parents and ground management staff to create sustainable, low maintenance food systems through-out campus properties. She collaborates with teachers to extend garden curricula and engages community resources to enable long term funding. Brie features initiatives to crowd source, grant opportunities and strategies to reach corporate sponsorship dollars. Empower students to learn practical skills by creating a garden classroom. Healthy living starts in every school. With so many people living in urban centers understanding how to grow in less space is paramount! Brie focuses on simple and affordable strategies including creative container programs such as the online retailer Gardenuity. She will also discuss vertical growing with the Live Wall and the Tower Garden. Green roofs and patio planters will be featured to educate and inspire attendees to create a bountiful harvest that is easy to manage in the smallest of spaces. Brie shares her favorite homegrown, time saving recipe for making a fresh Bloody Mary. Join Brie for a photographic tale of the most tantalizing fragrances found in the garden. Organized by season, learn about the best trees and shrubs to create a scented landscape to be enjoyed year round. From early winter flowering apricots and witch hazels to the classic scent of summer gardenias, theses plants attract pollinators, beneficial insects and gardeners alike. 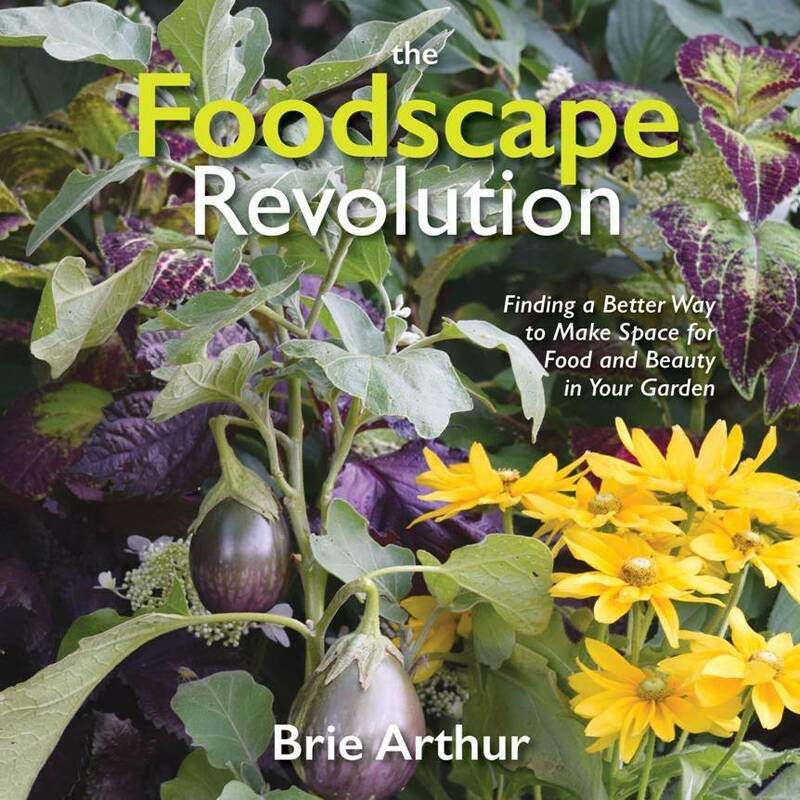 Join author Brie Arthur for a photographic tale of The Foodscape Revolution book tour. Having visited more than 350 venues, Brie will share stories of gardens across the US. From east coast classics, Chanticleer and Longwood Gardens to beloved gardens of the south such as Moore Farms and America’s first public garden Magnolia Plantation, this program is sure to inspire attendees and offer ways to recreate these scenes in your home garden. Heirloom tomatoes are the ultimate taste of summer! Brie shares expert tips for a successful, organic growing season. Variety selection and cultural information are shared in depth including how to deal with soil borne diseases and root knot nematodes. Best growing methods, fertilizers and staking strategies are discussed in addition to creative ways to maximize your harvest by growing in containers and in water. Learn to be an expert from all of Brie's experiences (aka mistakes!) and grow like a professional this year!Brie shares expert tips for growing heirloom tomatoes successfully with bountiful harvest! ‘Marketing to Generation Me’ will inspire green industry professionals to take the lifestyle of gardening to the next level. Learn from Brie as she discusses opportunities for garden centers, landscapers and garden clubs to reinvent themselves to attract a new generation. She explains strategies to connect with and retain millennial-aged customers who have diverse motivations and values. Brie has a fresh take to enhance your relationship with a new generation through the lifestyle of gardening. Colorful and creative succulents are taking the world by storm. Brie shares growing and propagation advice about her favorite tender and hardy succulents. She discusses creative combinations for year round interest and new introductions for cold hardy zones. Low maintenance, drought tolerant and eye catching, Sizzling Succulents will encourage everyone to indulge in this sustainable trend! Join Brie as she presents a photographic tale of one of the most cherished southern heritage plants, the camellia. Discover the historic “lure of caffeine” and how global trading routes, politics and war spread camellias from Asia to Europe and the new America. Over the past decade Brie has gathered cuttings from many 100+ year old specimens from the ancient collection of Magnolia Plantation and Gardens in Charleston, SC. Learn the history, the stories and the people behind iconic varieties. A photographic tale of Brie's favorite winter indulgences focusing on excellent woody specimens for interest between December- March. The presentation features trees and shrubs with winter interest branches, berries, foliage and flowers including 20 varieties of Prunus mume (flowering apricot) and 10 varieties of Hamamelis (witch hazel). The second half highlights Brie's favorite winter blooming camellias. You will never consider the "dormant season" boring after discovering all the color options from this program!